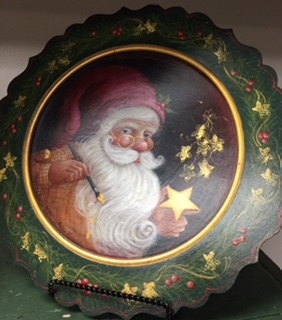 This beautiful Santa design by Helan Barrick is scheduled for May 6, Sunday...starting Christmas projects early this year!!! Hope you'll join me...gonna be fun! The class fee for this special one day project is $75.00 and includes photos, instructions, paints & mediums to use in class and refreshments. Students are asked to provide their own painting surface or special order the plate from Bobbie T. Arts.